In the small town of Todd Mission, Texas approximately 50 miles northwest of Houston is the largest renaissance festival in this country. 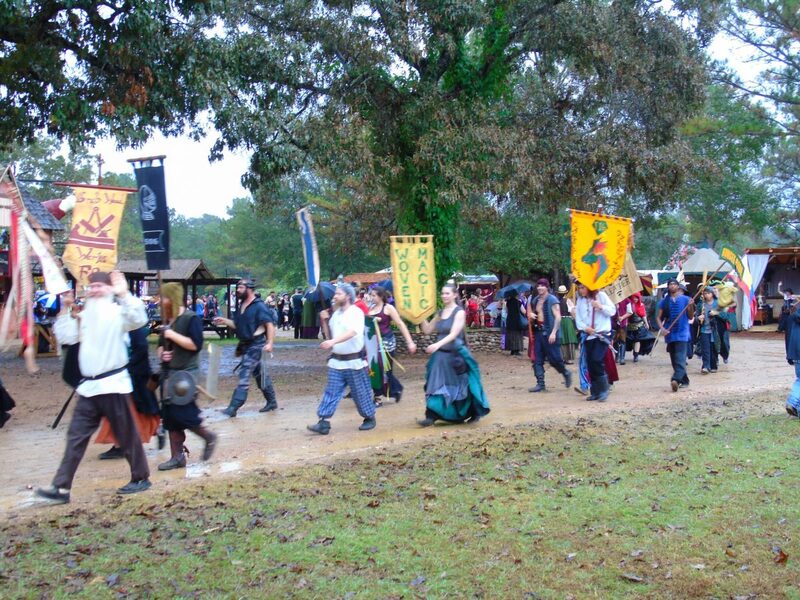 The Texas Renaissance Festival is 55 acres of fun, fantasy, and merriment. Founded in 1974 by George Coulam, the festival welcomes half a million guests annually who via their imagination, are transported to another time and land. The Texas Renaissance Festival proudly tips its hat to the over 500 costumed performers on 17 stages, and nearly 400 shops featuring unique artisans, merchants, craft vendors, human-powered rides and a diverse assortment of food purveyors offering mouth-watering dishes with a home-cooked flair. The festival runs eight weekends from October to November annually. Each weekend has a theme which in turn influences the vibe of the festival that weekend, the performances, games, and contests for that weekend. The themes for the eight-weekend event are Oktoberfest, 1001 Dreams, All Hallows Eve, Pirate Adventure, Roman Bacchanal, Barbarian Invasion, Highland Fling and Celtic Christmas. There is so much to see, do and taste that there is not enough time in one day. Thankfully there are hotels and B&B’s nearby that you can book a room at or bring your camping gear or RV and stay at the festival in one of their camping locations for a nominal fee. With 17 stages there is a wide variety of music and performances to choose from. They are all geared towards fun and frivolity with audience interaction. Have a seat in one of the many pubs and drinking (non-alcoholic drinks as well as mead, wine, and beer) establishments, rest your feet and strike up a conversation with the person next to you. You never know who you might meet! We met an individual who was a fire spinner performer at the festival but for her day job, she was a legal assistant who also dabbled in interior design! You will meet some interesting people! The jousting is entertaining to watch with knights vying for the maiden’s hand. There are many games for the young and young at heart to play. Not into games? How about a ride? The vendors gather together with flags and small displays of their wares to show off in a parade around the festival grounds. Every Friday and Saturday there is a pre-party (21 and over) to celebrate the start of the weekend. The decorations are elaborate and fantastic to see! There is a costume contest for the best dressed and a D.J. that plays a wide variety of dance music. There are so many interesting people there, both in costume and not, this is a whole entertainment venue on its own! What ever you do, have fun! There is something for everyone! Sample the food, wash it down with a cold beverage, cheer for the performers and browse the huge selection of shops with handcrafted one-of-a-kind goods! I love renaissance festivals. they are so much fun. We’ve been lucky enough to visit them in Ohio and California. So do we! We are lucky, Texas has some great ones!